Quantity, yes. Quality, no. usc has a ton of players in the NFL right now, but not one of them is expected to be a top-tier Fantasy Football player this season. For many of you, your first thought is: Who cares about Fantasy Football? All that matters is the real thing. Well, last year about 27 million people played. Besides, a player’s Fantasy Football success is tightly correlated to their real Football success. Sure, stats don’t always tell the whole story, but for the most part, the guy who scores the most Touchdowns and gains the most yards is going to be the most successful player in Fantasy Leagues AND in the NFL. So when virtually every expert Ranking has UCLA’s Maurice Jones-Drew at #1, #2, or #3 overall, it says a mouthful. Even playing for the mediocre Jaguars, and being coached by mediocre (ex-trojan) Jack Del Rio, Maurice is still expected to do what he’s done for the last two years: Get into the end zone more than just about anyone else in Football. Only Chris Johnson and Adrian Peterson receive the same respect (and rightfully so). M J-D is carrying 99% of the Bruin Flag in the Fantasy Football World. It is doubtful that any other Bruin will get chosen in the Nation’s Fantasy Drafts, which all happen over the next three weeks. It is possible that a Bruin fan will take a flyer on Jones-Drew’s teammate Marcedes Lewis, but with Del Rio’s conservative gameplan, and with David Garrard still at Quarterback, Lewis will not be among the top dozen Tight Ends, statwise, by the end of the year. Neither will Spencer Havner, even though he has been effective for Green Bay in goalline situations. Kahlil Bell plays for the Bears, and showed some flashes last season, but 3rd-string Tailbacks aren’t usually factors in Fantasy Football. Likewise, Terrence Austin, Matthew Slater and Matt Willis won’t get any love, because Drafts aren’t that deep. But these guys were never expected to be NFL or FFL studs. They are hardly underachieving. It’s the stable of ex-trojans who are failing to live up to their hype. Mark Sanchez had an exciting and unprecedented Playoff run with the Jets last year, but the FFL prognosticators are not giving him any credit. They claim that the Jets did it on the Ground. The Jets called more running plays than anyone else in the League, by a very wide margin, and the explanation is that Sanchez was way too careless with the ball, inconsistent, and untrustworthy. Even with this year’s new addition of All-Pro Wide Receiver Santonio Holmes, Sanchez is still considered a horrible choice to be your Fantasy Starting QB. Believe it or not, I personally believe that the experts are selling Sanchez short, and that he may show marked improvement between his Rookie Season and his second year. He still has a great Offensive Line, and Defenses will design schemes to stop Shonn Greene and New York’s Running Game, leaving Sanchez plenty of time to find Homes, Braylon Edwards, and Jerricho Cotchery. He may even capitalize on having LaDainian Tomlinson, who can definitely catch a swing pass out of the Backfield on big 3rd downs. If Tomlinson still has something left, it will destroy the hopes of two ex-trojans: Joe McKnight is their 3rd-string RB, and Chauncey Washington is buried on the Jets’ Depth Chart as well. Since the Jets run so much more than anyone else, it’s possible that someone may draft Joe McKnight in a late round, but based on his lack of production for the Pro Team in L.A., I would be surprised if McKnight became a consistent contributor this year. Of course, if Shonn Greene gets hurt, then McKnight will definitely have an opportunity to get on the map, and behind that Line, he could actually be productive. The NFL ex-trojan who should be the most productive this season is actually predicted by most to be this years Biggest Bust. In Arizona, Kurt Warner (and his Wife) have retired, leaving the job in the hands of Matt Leinart. Over the last few years, Warner has been a Fantasy star, piling up huge stats, taking the Cardinals to the Super Bowl, and helping make Larry Fitzgerald the League’s Premier Receiver. But no one expects Leinart to carry on the tradition. The great Fitzgerald has actually been downgraded by most publications, due to their distrust of Leinart. In Leinart’s defense, their critiques of his play and lack of production center on games from 3 years ago, and it’s not insane to think that he might be improved this year, especially since he doesn’t have to compete with a potential Hall of Famer any more. I think former All-Pro Derek Anderson is there just to keep Leinart from partying too much, but many analysts believe Anderson will be the Starter by midseason. Besides Leinart’s past performances and general lack of ability, there is one other good reason why he won’t duplicate Warner’s numbers: Anquan Boldin is gone, replaced in the starting line-up by Steve Breaston. That’s a huge dropoff. In the Pro’s, Breaston has never lived up to the potential that he showed at Michigan. So Fitzgerald will now see more double coverage, and his numbers probably will go down, but not totally because of Leinart. While Fitzgerald is still in most WR Top 10’s, Leinart is not even in the QB Top 20. Above Leinart, slightly, is another sc QB who isn’t expected to produce: Carson Palmer. Palmer gets Terrell Owens and Chad Ochocinco, with resurgent Cedric Benson in the Backfield, but what he doesn’t get is any respect from the pundits. They don’t think that the addition of T.O. is going to change Cinci from being a run-first Offense, and they don’t see Palmer as a Fantasy Starter. When T.O. became a Bengal, but BEFORE I read all of the expert advice, I had seen Palmer as instantly among the Fantasy Elite, but on this one, I will defer to the experts. Matt Cassell is the starting QB for Kansas City, but Cassell is ranked even lower than Leinart. Kansas City is one of the worst teams in the League, despite a Running Back — Jamaal Charles — with the best yards-per-carry average in the league, at 5.9. If anyone drafts Cassell, there will be a chorus of those sarcastic, nasal, suppressed laughs, throughout the room. At least you can’t say he’s overrated. Every year, I think that Reggie Bush is under-rated in Fantasy Drafts, and every year he under-performs and makes me wrong. This year, once again, I expect him to get twice as many Touchdowns as in the Past. They got rid of Mike Bell, who was a TD vulture for Bush, and new third-stringer Lynell Hamilton just went down with a season-ending injury, which should afford Bush a few more red zone opportunities. And obviously, New Orleans is still going to travel to the Red Zone as much or more than anyone else… unless you believe in the Madden Curse — Drew Brees would be this year’s victim, as the latest cover boy for the legendary video game. The other reason why Bush might have a career year: If he has to return his Heisman Trophy, he may channel that humilation and anger into an unstoppable drive, and a desire to redeem himself. Also, he’ll have all the Saints supporting him, and trying to help him overcome his inevitable depression, and that could include calling his number more near the goalline. 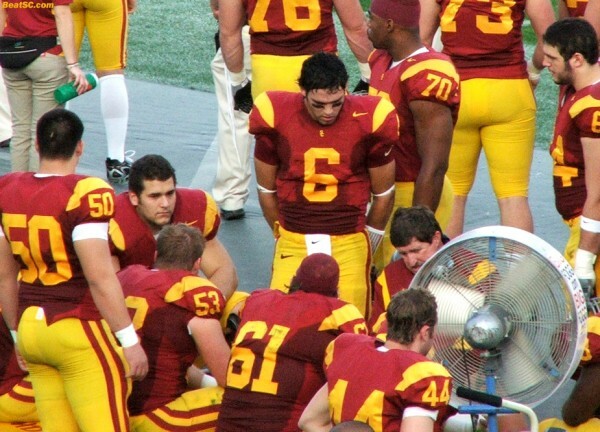 Another ex-trojan who may be under-valued is Placekicker David Buehler of Dallas. With Tony Romo leading a dynamic Offense, Buehler should put up TOP 10 Kicker Fantasy Points, even if his accuracy and range are more like 25th. But the experts have split the difference, placing him in the high-teens on the Kicker Lists. The one trojan who WAS highly-ranked is NY Giant Receiver Steve Smith. Even as a possession-type Receiver, his stats elevated him to Top 20 WR status. However, he recently sustained an injury, so he now becomes a risky pick. When a player has a little red cross next to his name on the Draft Cheat Sheet, there is always someone else equivalent — and healthy — that you can select instead. Also, the Giants’ Defense broke down last season, forcing Eli Manning to open up the Offense. This season his passing numbers are not expected to be quite as prolific. But despite those lesser projections, and despite the injury, Smith is still listed in the Top 20 Wide Receivers, usually right next to the other Steve Smith, who used to be one of the league’s best. Carolina’s Steve Smith is being downgraded to late teens for two reasons: The analysts have zero faith in former Bruin-turned-Beaver QB Matt Moore, and they have even less faith in the Panthers’ other Receiver, ex-trojan Dwayne Jarrett. Talk about not living up to potential… Just like Jarrett’s old roommate Leinart, Jarrett is half-expected to lose his starting job by Week 8, and considered a do-not-draft, non-prospect. Speaking of ex-trojan non-prospects, the guy sc’s Steve Smith punched in the jaw, Dominique Byrd, is still playing, but he’s listed as LEINART’S 4th-string Tight End in Arizona. Byrd’s name may not even be pre-printed on the cards in the Draft Kit. Same for Mike Williams, the former All-World trojan Wideout, who is getting another chance with Pete Carroll and Seattle. However, nothing in the last half-decade would make a Fantasy Owner draft him. Washington back-up Tight End Fred Davis might be a better pick, with Donovan McNabb becoming a Redskin, but Starter Chris Cooley will probably keep Davis from breaking out. The trojans also have two players starting the season on DRUG SUSPENSION. Brian Cushing, depite his ourageous claim that he has a never-before-diagnosed medical syndrome that caused his failed drug test, will not be helping the Houston Defense until Week 5, and LenDale White won’t be in the Denver backfield for the first month of the Season. Filling in for White may be fellow Fig Techster Justin Fargas, who just signed with the team. Even if he tops the Depth Chat, his selection on Draft Day would generate more snickers than Mars, Inc. Sort of like if someone mentions Stafon Johnson, who is a 3rd or 4th string Rookie Tailback for ex-trojan Jeff Fisher in Tennessee. Some Fantasy Leagues draft Coaches too, so that puts Fisher, Del Rio, and Carroll in the spotlight. The Vegas Oddsmakers take care of this one for you, telling you exactly how many wins each Coach is expected to get this year. They’ve got Fisher at 8-8, and Del Rio and Carroll at 7-9. None of them make the Top 16, and only the Top 12 should be drafted. Still, I could see drafting Carroll, in case he figures out a way to cheat in the NFL, too. Compared to Carroll, Bill Belichick was an amateur. This is what you call a “risky” Draft. It could be a high-scoring bunch, or it could be producing almost all goose eggs by the halfway point of the season. I rather get Maurice Jones-Drew, and any other random 8 players to fill the other slots. "TROJAN PRETTY-BOYS ARE NOT VIABLE FANTASY OPTIONS" was published on August 13th, 2010 and is listed in Blue & Gold News, News from the Dark Side, UCLA/usc/Sports Photos. Haha this is funny, I don’t think any FF player would pick these guys 1st round even if the loved usc….I hope MJD gets some help, Don’t want him tiring out being the only guy out there for the jags.